You can have a clean and organized bedroom with these tips. Just about every room in the house has at least one -- a clutter hotspot. You’re familiar with them: the stack of unopened mail on the kitchen table; the pile of shoes, backpacks, and sporting equipment in the foyer; the junk drawer in the kitchen; the crazy collection of clutter on the living room coffee table’s shelf. Your bedroom isn’t exempt from the clutter craze – although it should be a soothing retreat, free from stress-producing disarray, the truth is, the battle against disorganization requires constant vigilance. Whether your own room is chaotic in all five of those spots, or just one of them, taking steps to conquer the tumult will leave you feeling satisfied with yourself and sleeping better at night. Every bed deserves at least one nightstand by its side. After all, you need a spot to hold your bedside lamp (although in the smallest bedrooms, hanging pendant lights or wall sconces are also options), box of Kleenex, glasses and reading material. For many people, a glass of fresh water is also a necessity; why pad out to the kitchen when you wake up thirsty? What your nightstand shouldn’t be, however, is a repository for toiletry items better suited to the bathroom, dirty dishes, or teetering stacks of outdated magazines. The easiest way to get your nightstand under control is to completely empty out the drawers and clear off the top. Now, throw out anything that belongs in the trash, and put anything that belongs elsewhere in the house back in its proper spot. Once you’ve dusted the furniture, you are ready to organize it. Dresser drawers easily become overloaded, making it difficult to open and close the drawers and impossible to see or find what you want to wear. As with all decluttering projects, the first step is to empty out all of the drawers. Once empty, take the opportunity to line the drawers with pretty paper; it’s easy and you’ll feel pampered when you open the drawers on those tired, early mornings. 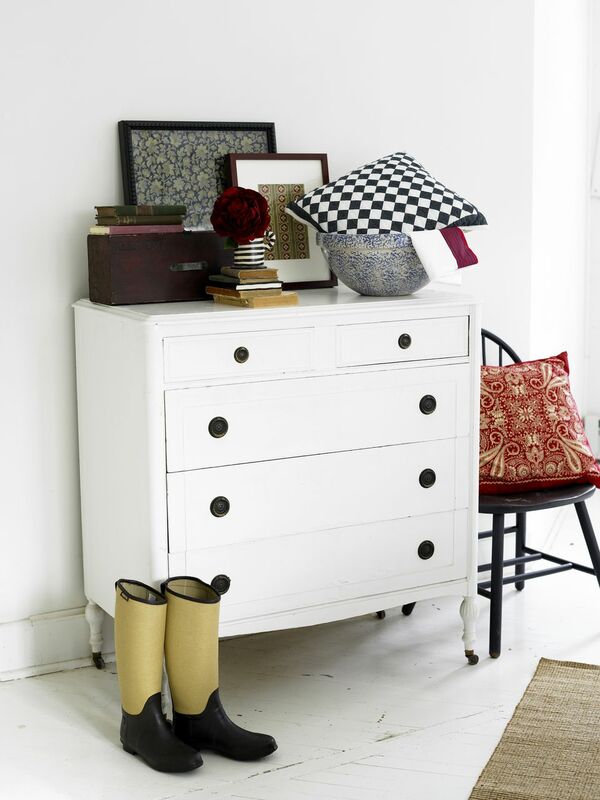 Add a few drawer dividers to increase the holding power of your dresser. You’ll find a wide assortment of drawer organizers at any bed n’ bath shop, or on Amazon.com. Don’t let the prime real estate of your dresser’s top go to waste buried under a pile of clutter. Instead, use this spot to add appeal to your bedroom. For a Pinterest-worthy dresser top, you need to create balance. That means something large on the wall behind the dresser – in many bedrooms that will be a window, but if not, let a mirror or piece of artwork take center stage. Next, set a lamp, tall jewelry box, or collectible on one side of the dresser. On the other side, create balance with a couple of items that are smaller than your large piece – perhaps a vase of flowers, smaller jewelry box, potted plant, or a prized collectible. Finally, corral jewelry, perfume bottles, or small toiletries in a pretty tray set in the center of the dresser. You probably rarely give the underside of your bed a second thought, but it’s often a breeding ground not only for dust bunnies and other allergens, but also for clutter. Conquer the dust with a thorough vacuuming, then battle the disarray. Far too many bedroom closets are black holes where shoes, clothing, and accessories disappear into the unknown depths. It doesn’t have to be this way, though; even a small closet can be organized and user-friendly. Once again, to truly conquer your closet, you’ll need to first remove everything. Throw out the trash and put the items that belong elsewhere in their proper locations. Box up the donations, and take the box right out to your car so you aren’t tempted to change your mind later. Now you’re left with only the items you wear or love. Before restoring them to the closet, however, take time to really clean things up. Vacuum the entire closet, and wipe down the shelf. Now’s the time to set up some closet organizers – you can double your space by getting creative with hanging organizers, shelf doublers, shoe racks, and multi-garment hangers. And a fresh coat of paint works wonders in beautifying a typically forgotten space; this is a great spot to try out that bright color you love, but fear to use in the main part of your bedroom. When it’s time to put away your clothing, decide on a system for hanging your clothes. You might separate garments by type -- pants, blouses, skirts, dresses – or hang outfits together, although this makes it more difficult to imagine different ways to combine your clothes. Store special-occasion garments towards the back of the closet, frequently worn items towards the front. Shoes belong on an organizer, or stored in shoeboxes on closet shelves. Use special hangers or hooks to hold accessories. Try and limit your bedroom closet as much as possible to clothing, shoes, and accessories. If you must store other items there – boxes of papers, extra blankets, sporting equipment – consider having a few high shelves added to make the most of the closet’s vertical space. Once you’ve won the clutter war, the secret to maintaining the peace is to take an extra moment or two each day to put things away. The results are worth the extra minute it takes to hang up your shirt or put your undies in the drawer -- your bedroom will look better and be more relaxing, and you’ll feel more in charge of your surroundings, which translates to feeling more in charge of your life.